Sugars are built of Carbon, Hydrogen and Oxygen in many different formations. In the body they are used as a direct energy source, or can be stored as energy for later use (fat). The simplest sugar molecules are glucose (grape sugar) and fructose (fruit sugar). These are also called monosaccarides. They are the ones responsible for giving the sweet taste to your food. They can be absorbed directly in your guts and are a fast energy source. The body can only use these simple glucose molecules for energy. 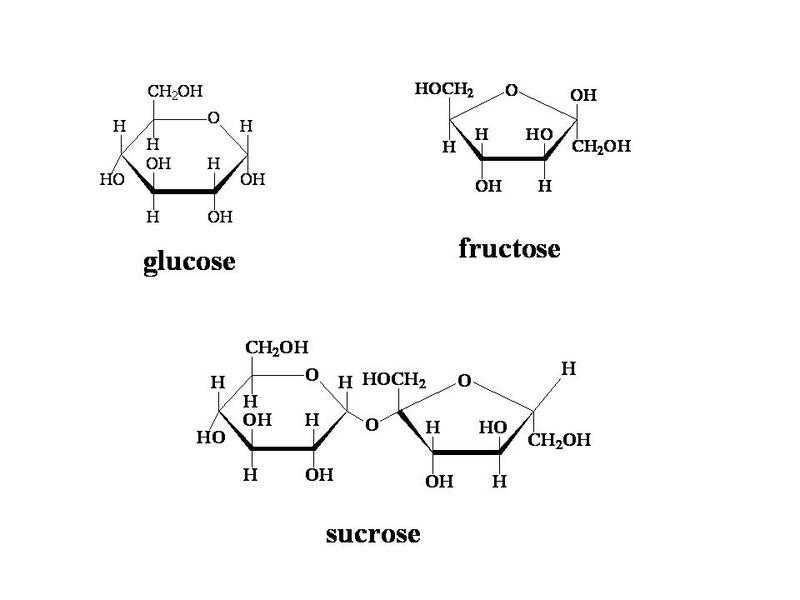 When combining these simple molecules in different fashions, they build bigger structures, like sucrose (table sugar) and galactose (milk sugar). These are called disaccarides (two monosaccarides combined). When more monosaccarides are combined they are called polysaccarides, like starch, cellulose and glycogen. Starch is the bulk in food like potatoes, pasta, rice, wheat and so on. These molecules need to be broken down into monosaccarides before the body can absorb them from the gut and use them for energy; that’s why they are called ”slow sugars”. They are also referred to as having a low Glycemic Index (GI) . It takes time for the body to break them down and absorb them, hence they raise the blood sugar more slowly than the simpler molecules like glucose and sucrose (fruits). Cellulose cannot be broken down by the human body, and thus can’t contribute to our nutrition directly. Cellulose is what makes up the structure of the cell walls in plants and passes through the bowels, called dietary fiber in daily speach.Parts of it will be broken down in the large intestine by the bacteria that lives there – our gut flora.The bacteria contains certain enzymes that the cells of the human intestine lacks and converts the indigestible parts to short chain fatty acids, that can be used by us as a useful energy source. They also contribute to the absorption of minerals, such as calcium, iron and magnesium. Read more about the gut flora here. 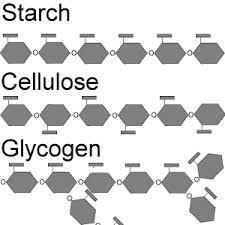 Glycogen is form sugar takes when being stored in the cells. When there is energy in abundance (in the form of glucose), the cells of the body, primarly muscle cells and liver cells, will store glucose in this complex molecule. They are ready to use when bursts of energy are needed. The cells in the body will need the hormone insulin to facilitate the uptake of glucose in their cells. It functions as a key to the sugar door into the cells. Without insulin the glucose will stay in the blood stream, unavailable for the hungry cells. This is what happens to people with diabetes, and they are unable to take up the sugar from their own blood.